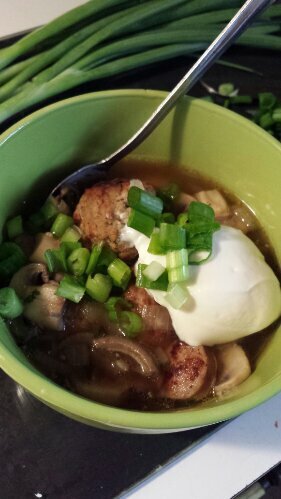 I’d seriously been wanting to make meatball soup for years. Since back when I’d attended a wedding expo in 2003 or 2004 and one of the exhibitors was a local Italian restaurant. The only thing I remember from that expo was the amazing little meatball soup sample I’d had from that restaurant. It was the best. I don’t know what stopped me from looking for a recipe all these years, but yesterday, as I walked through the isles of HEB to the milk section (what I originally went for; typical!) I searched Pinterest and found this recipe. I changed it up a little, to correspond just a bit better with the Keto/low-carb diet. Jorge said he was truly impressed (initially texting back meatball soup?? when I told him what I wanted to make since I was making the kids spaghetti and meatballs). And so, here is the recipe! 3 Johnsonville Beer brats, sliced and sautéed. Warm olive oil in a large soup pot over medium heat. Add onions and mushrooms, and sauté. When onions are clear, add minced garlic, salt, pepper; dried parsley and a few dashes of chipotle powder. Stir occasionally for 5-10 minutes. Pour in broth and bring to a gentle boil. Add cooked meatballs and sautéed beer brats to pot with vegetables and broth. Reduce heat to med-low and simmer 20 minutes. Remove soup from heat and immediately ladle into bowls. Top each serving with 1 tablespoon sour cream and toss in some diced chives. And that’s it! I loved it so much I brought some to work with me :). Enjoy! Oreo Brownies Recipe and Eenan’s 14th Birthday! i made this soup with the meatball recipe and it was so good. Thanks for sharing this 🙂 ?????? That’s great! You are so welcome!! It’s been a while since I’ve made it, now I want some hehe ^_^.